10 days before check in time - free, after that 50% fee, no show or cancel last minute 100% of the fee will be charged via your credit cards provided to us. We offer welcome drink and free shower when you arrive if no room available for early check in. Free parking car or motorbikes and storing luggage. Free security deposit and wifi. Please contact us: sapastunningviewhotel@gmail.com if you need any assistance from us. We have enough rooms for group of 15 to 23 people. We can arrange some good and cheap tour for the group trekking or motorcycling or car with driver visiting Sapa villages with minorities and rice terraces, riding on the highest mountain pass in Vietnam or staying in new Stunning Homestay in Hau thao village with local family. Welcome to Stunning View hotel!!! 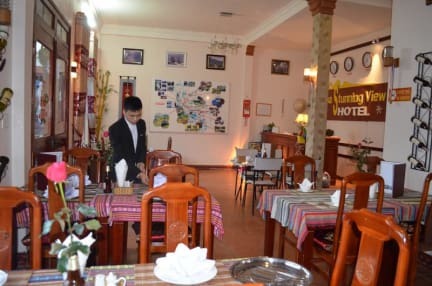 Sapa Stunning View Hotel is located 100m away from tourist street and on the way to the villages so it is very quiet and peaceful,and is a very good place to relax and unwind. It’s very easy to find out and go to center of the town, only about 7-10 minutes walking.you will get to Sapa old stone church, market, square, park, lake, etc... and 38 km to Lao cai train station. There are 20 equipped rooms with satellite TV, high speed wifi,heater or fan, kettle, working desks, coffee table, private bathroom with hot shower, a safety box in the reception and a big fridge in the kitchen, etc. 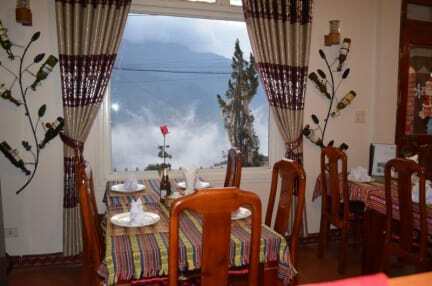 Almost the room has private good valley view balcony or window face to whole Sapa town ,green valley,Hill tribe village,Fansipang peak and new cable car from sapa town to Fansipang peak. You will be welcomed and invited home-made tea when you come to the hotel. All information about Sapa is informed freely for you by good English speaking and helpful local staffs to make sure that you will have very wonderful time in Sapa. 4).Child under 5year: free of charge. Child from 5year or extra Adult: surcharge $5/person/room/night. Cancellation/change later or in case of no--show, the deposit night will be charged..